Gibson’s ES-175 is an iconic guitar favoured by many famous players ranging from the incredible Joe Pass through to the likes of Steve Howe [of Yes] and jazz virtuoso Pat Metheny. What a lot of followers of this wonderful guitar may not know is that Gibson also introduced a slimmed-down version of this guitar in the 1970’s. – the ES-175T. Gibson ES-175T – These instruments were only manufactured by Gibson for a short time period between 1976 and 1979 and were discontinued thereafter, making this a rare and highly desirable guitar. Sporting all the high quality craftsmanship that you’d expect from Gibson, but with a much thinner body depth, this twin pickup beauty would be ideal for those players who are migrating from a solid body guitar. 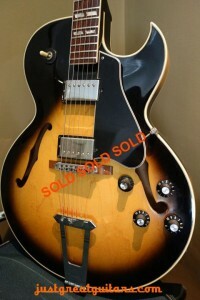 Introduced by Gibson in 1976, the ES-175T was brought into production as a thin-body variant of their ever-popular ES-175 but with an ES-335 style depth. [The ‘T’ in the name stands for Thin] This design concept was actually a great idea however the ES-175T was only produced for three years in total [up to 1979] making this now a rare and highly desirable guitar. It was available in sunburst, blonde and wine red finishes. So if you want a more ES-335 style instrument without the larger body depth associated with the regular Gibson ES-175 this could be just right for you. Tonally versatile, this guitar isn’t just for the jazzers either and it comfortably handles overdriven tones as well as more traditional jazz sounds with ease. Jazz rock anybody? My wife plays a 1977 175T in wine red. I originally bought this for myself but she took one look at it and adopted it immediately. They are hard to find, especially in good condition. Are the Gibson 70’s original humbucker pickups a lower output than say a current 57 PAF style pickup for this guitar? I have a 77 model and the output is lower than my other style Gibsons. Sounds ok but just not as loud.